The Rohingya issue in Myanmar is complex and subject to many misinterpretations which must be better understood. This is at the heart of the message of Salesian Cardinal Charles Bo of Yangon (Myanmar), which His Eminence has provided to ZENIT on June 16, 2018, and can be read in its entirety below. 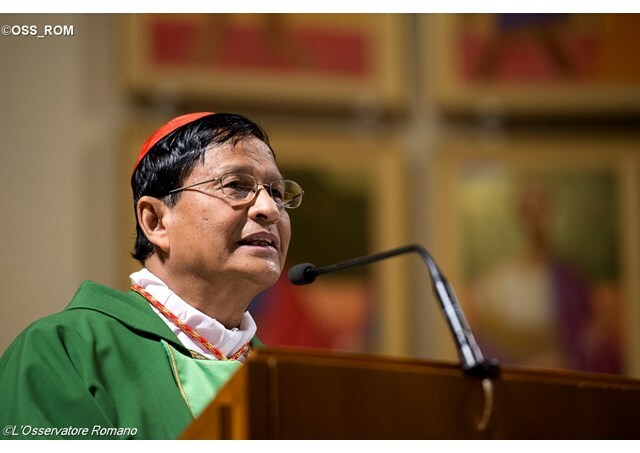 Cardinal Bo made the speech recently in Melbourne, Australia, to Church leaders and political personnel. What is the problem according to your perception? You know the recent events. History and identity is highly contested. There is no historical proof to say Rohingya as a people ever existed and the claim that they came before the British is a “falsified” history. They are “migrants” either from British India or recently from Bangladesh. They have no right to claim they are one of the ethnic groups like other ethnic groups. As per Rohingyas, especially those in the diaspora, the history and identity is of no contest. Rohingya presence was at least 500 years with the Muslim kings in the region. the Rohingyas are the Trojan horse for establishing the Islamic State in Myanmar. Islam has an agenda to capture non Buddhist countries and create a pan Islamic [state] from Saudi Arabia to Indonesia. The Rohingya Population is ‘exploding’ and would ‘sink’ the Burmese Buddhist population very soon. Such fake news and hate speech are used by a fraction of the religious elite and in a deeply religious country they are believed. Radicalising the minds of the people of Myanmar is the great tragedy. A country that is transitioning to democracy– without any truth and reconciliation process- sooner or later needs to confront its wounded past. There is no peace without justice. Unfortunately after 60 years of dictatorship, democracy arrived and all presumed the old wounds would be submerged in the mega spectacle and democracy would submerge all wounds. A scapegoat is needed and the result is for you to see. International Islamophobia comes naturally to extremists. Myanmar strategic location and its vast resources are great curse. The Rakhine state where the conflict rages is also the place of both superpowers, India and China which compete for trade routes and resources. Sadly the Rohingyas sit on these aspirations. Companies and cronies have already begun the process of land alienation from our farmers. The global Islamophobia is an easy tool. The Rohingyas are not violent people, but the fact that they are Muslims provokes a phobia. The West leads in this and countries like Myanmar are emboldened by the bans and discrimination of these people. The world has to understand the painful process of decolonisation. The British used the poor to do the dirty job of their empire. The British did not fight the war here though British officers led the fight. The foot soldiers are south Asians. They transported huge populations for cheap labor and military. When they went away they abandoned the communities at the mercy of majoritarian communities. The word Rohingya – you have publicly requested not to say and the Pope also avoided that term. It was not a personal decision. I reflected the consensus of the people who were in the preparation committee. Every group has the right to call itself in whatever name it feels comfortable. But in Myanmar names are such contentious issues: Even the country name was contested till recently. Even Daw Aung San Suu Kyi for long time refused to use the official name: Myanmar. She was referring to this country as Burma. Even the Burmese refuse to agree on a name of the country. It was no wonder the very name of Rohingya is contested. Even religious terms are often contested. A fringe extremist group which knew the Pope’s concern for the cause of Rohingya was getting ready with measures that might unnecessarily bring conflicts. These are times of “Fake news”. Not even American government could escape. We had great difficulty because some of the fringe groups were spreading rumors that the visit was only to support the Rohingya cause. Among Christians this was a painful issue because the Kachin conflict and displacement is going on for decades and most of them are Christians. After deep reflection we felt that this visit should be a visit projected as the pilgrimage of ‘Love and Peace.” We requested the Pope and he understood the local context. The Pope’s visit was very challenging – how did you manage it? o Pope Francis the conscience keeper and was never afraid of raising his voice on behalf of the suffering people. When the proposal for the Pope’s visit came, the government was very enthusiastic in welcoming the Pope. Just a few months before that the leaders agreed for diplomatic relations. Everybody knew that the Pope had a soft spot for the suffering Rohingyas and raised the issue in his prayer meetings. Then the militant attack happened in August. Army retaliated and thousands fled the country. Then local extremist groups let loose hate talks and warned the Pope of any mention of the word Rohingya. We took the painful decision keeping in mind the troublemakers’ agenda and requested the Pope to avoid this. The Pope must have had his own opinion but agreed to our request. But his visit was a healing presence. He met all stakeholders, all democratic leaders, military leaders and Buddhist clergy. His central message was: Reconciliation, peace and harmony. What according to you is the solution? o This is a vexing question. As Buddhism strives to have two virtues of compassion and mercy the country should look at humanitarian problems through the eyes of compassion and mercy. Unfortunately hate speech makers are influencing people. This should stop. The present government tried to control the extremist group Ma ba Tha. But this is a challenge. o The government should revisit the 1982 citizenship laws. They are very contentious since 1853 is a very difficult date for any people to prove. Some of these people were allowed to vote in the elections and some were even members of the parliament and even ministers. So there was an implicit acceptance of their citizenship. It is better start with the measure. o The world media need to be critical but engage the stakeholders here. The government is not at war with Muslims. There are thousands of other Muslims living in other parts of Myanmar. Anti-Muslim riots in the recent past have been controlled. Islamophobia of the West is a great trigger for fanatics. I am not sure much is done in this regard. o The government has taken some positive steps : It has Kofi Annan recommendations. It has sought the help of a Thai diplomat to pursue the recommendations. It has started the process of verification. It has held bilateral talks with Bangladesh for the repatriation. It is a slow process and it is heartening to see that the government of Myanmar is engaging its neighbour. o What has happened is a very painful humanitarian tragedy : Peace can be elusive if stakeholders including western civil society hold onto strong words. Ultimately justice needs to be done for the affected people who need understanding and negotiations. Condemnations and sanctions do not work in Myanmar. People had to wait 60 years to taste democracy. It is fragile. To the millions of Myanmar people Daw Aung San Suu Kyi is the only hope of nurturing this fragile democracy and see it enter into robust health. Attack on her is counter productive for the future of democracy. All one needs to remember is that the army took over from civilian government more than twice. More than anything, the Holy Father’s visit was a peace pilgrimage. He urged all : the government, army, civil society and the monks to work towards peace and harmony. In the meeting with the Bishops he urged the Catholic Church to use its resources to work proactively for peace. He has urged the Catholic Church to be peacemakers. In the public Mass, he urged the Catholic Church to be an instrument of peace. We have used our discrete channels to reach out to the affected areas. We have extended help to the affected population. Our network of Caritas has set up offices in the Rakhine areas and our relief efforts have been upscaled. The return of the people will see our involvement increased. The Church has been organising interreligious initiatives for peace with the participation of all the people. We play an active role in all peace initiatives and the Panglong peace conference. The Church is an active member in the worldwide body of RELIGIONS FOR PEACE. During the recent meeting in Yangon, the international representatives could meet the government and offered the services for reconciliation. Christian presence in Rakhine state is being increased. Christians have a vantage point of reconciliation between the communities.